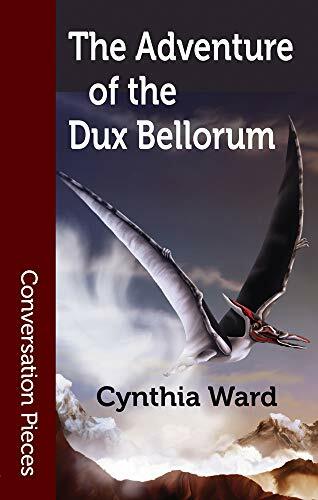 The Adventure of the Dux Bellorum is the sequel to Cynthia Ward’s The Adventure of the Incognita Countess, which we previously reviewed here. Overall, everything is bigger and broader in this follow-up novel. The scope of the adventure is expanded from the confines of a certain doomed ocean liner to the trenches of World War I. The stakes are higher as a famous British politician is taken captive. And the action is ramped up as the focus is less on intrigue and cloak and dagger in favor of more overt action and adventure. In fact, one of my main complaints about the first novel, that some of the action is delivered second hand, is addressed in this novel, as Lucy plays a much more active role than she did even in the first novel. Ward continues the series with calling out other pulp (and proto-pulp) properties. The main character is Lucy Harker, the daughter of Mina Harker and Dracula. The Holmes brothers make an appearance, albeit mostly off camera. There’s references to a Martian invasion, hollow earth expeditions, wolfmen, mechanical menaces and lost races of dinosaurs. There’s even a reference to the infamous thief Fantomas, and while that illustrious criminal doesn’t directly grace the pages of this particular volume, there’s plenty of opportunity for him to appear later. All that is well and good, but where Ward’s work shines is in the development of the relationship between Lucy and Clarimal (better known as the vampire Carmilla). There’s the question of whether a love can be immoral when two people deeply care about each other. There’s also a sense of the tension between the old world and the new, as old superstitions and rites lose their efficacy and science becomes more predominant. Ward doesn’t quite answer the question as to whether the two can coexist, though the sense in her work is that there is a scale and science is weighing heavier than religion… a difficult prospect when some of the characters remember when religion ruled over all. Suffice to say, if you are looking for a simple, quick, pulse pounding read, you may end up disappointed because Ward is able to layer in additional nuances to her work that are typically missing in classic pulp but that speak to the world at large. Despite being a historic fantasy, the questions posed in the Dux Bellorum are as relevant now as they would be during World War I. This entry was posted in Fiction, Pulp Consumption and tagged book review, cynthia ward, dinosaurs, hollow earth, mad science, pulp fiction, vampires, wolfmen, World War I. Bookmark the permalink.